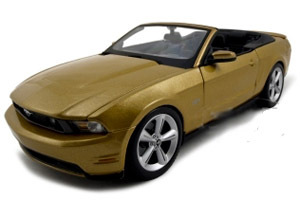 Here are the latest and greatest new Mustang Diecast Cars, covering 2008, 2009 and 2010 models. And when I say Mustangs, I also mean Shelby cars. And new, for 2013 (shh... It's actually available now!) is the really cool 2010 convertible you'll find below. 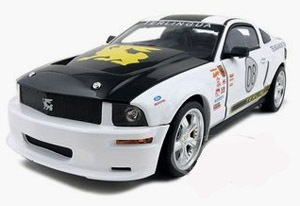 If you're looking for a 2011 Mustang diecast car, there's finally some available and you'll find them in the diecast 2011 Mustang section. I've tried to include a wide range of prices and detail, so whether you're looking for a nice inexpensive and kid proof diecast car, or a true collector piece you'll be able to find the model you like. For further information, including prices, and additional colors, click on the blue links. 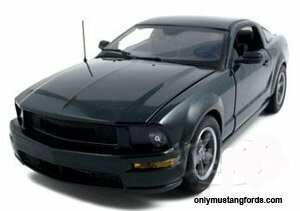 In 2008, Ford brought back a new updated version of the amazing 1968 Mustang Bullitt, the real star of the Steve McQueen movie, "Bullitt", and this beautifully crafted die-cast 2008 Mustang GT Green "Bullitt" is one of only 5,000 produced. Just the thing for the Mustang enthusiast who appreciates fine attention to detail and authenticity, from it's cold air intake, de-chromed body to it' finely detailed "Monte Carlo bar" chassis stiffener! 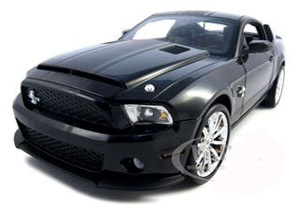 Here's a beautiful 1/24 scale 2008 Shelby GT-500KR which is also known as the King of the Road Shelby. This is a true wolf in wolf's clothing,with a 5.4 liter engine pumping out a whopping 540 horsepower! Like the original, its a limited production car. Yours will be 1 of only 1,000 made. 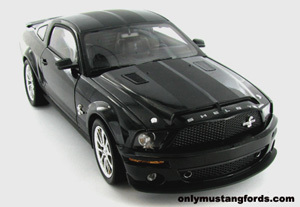 If Black is your color, then look no further than this awesome die cast Black Shelby GT 500KR . If you're looking for all out Mustang V6 performance, this white 2008 Shelby Mustang Terlingua Team Car could be your car. 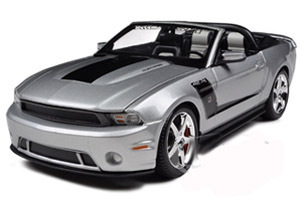 Supercharged performance and awesome 08 Mustang styling make this the best of both worlds. This ain't no secretary's car! Here's Ford's recreation of the 2008 Mustang Bullitt in it's exclusive Hyland green color and special Bullitt wheels. This one's a nice 1/18 scale reproduction. 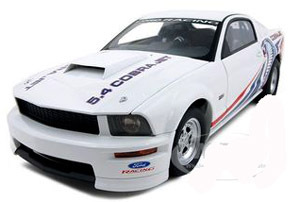 If you are a fan of the 2009 Ford Mustang Cobra Jet CJ , then this 1/18 scale reproduction is for you. It was truly a production race car. And some very fortunate people got to own one. If you don't mind a smaller version, you still can! It's been a long wait, but if your favorite Ford Mustang is a 2010 Mustang Convertible , this beauty is just what you've been looking for! And ya gotta love it in gold! 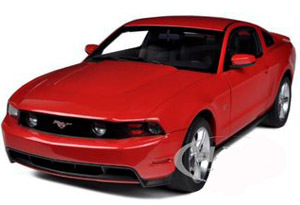 If you've been craving a nice Torch Red 2010 Ford Mustang GT you're in luck. This fastback GT beauty is 1/18 scale and very nicely detailed inside and out. Not everyone wants a stock pony car. Here's one of the nicest Stang's made by the folks at Roush. It's the 2010 Roush Mustang Convertible 427R decked out in a classy silver, with Boss 302 reminiscent black side hockey stick stripe. Available in a sleek jet black, the Super Snake comes complete with matching pewter stripes and of course the Cobra logo at a perfect, 1/18 scale. Stock paint job? Never! 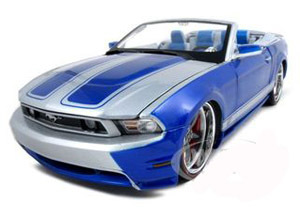 Check out this wild 2010 Mustang GT Convertible pro street machine. Painted two tone, with deep blue and silver with custom stripes on the top and sides, this is one convertible pony car no one will ignore. Torch Red, with white stripes, the classic Shelby look, in this 2010 GT500. It's available in 1/18 scale. Looking for other model years? Here's the most current list of cars available"